Arizona’s educators are set to begin striking today. With a school system covering a million students, the walkout will be the largest yet in the current strike wave. It will also likely be the most contentious. For years now, Arizona has been ground zero for the implementation of a host of reactionary policies, including tax cuts for the wealthy, school privatization, and racist anti-immigrant crackdowns. There’s every reason to expect that it will take a massive and sustained work stoppage to force Arizona’s Republican elite to grant educators’ demands for increased pay and school funding. Despite the unfavorable political context and the absence of strong labor unions, Arizona’s teachers and staff are remarkably well-prepared for this struggle. Led by a dynamic group of young rank-and-file militants, tens of thousands of educators have managed to cohere into a formidably organized force in less than two months. Given the strength and intransigence of the contending sides, Arizona appears to be on the brink of a particularly explosive political battle. Arizona’s public education system has reached a breaking point after years of austerity. Students and educators across the state are faced with a litany of problems: excessive class sizes, broken desks, crumbling ceilings, chair shortages, rodent infestations, school buses without air conditioning, and outdated school material. One teacher noted that her classroom map has the Soviet Union on it; another pointed out that school textbooks still list George W. Bush as president. We are underfunding our students every single day — every single student in the state of Arizona is being underfunded. And by doing so we are throwing away an entire generation’s opportunity for academic success. We have a crumbling public school infrastructure here right now. And that’s unacceptable. We’re truly in a state of crisis. Arizona salaries are also infamously low. Pay for the state’s elementary school teachers currently ranks fiftieth in the US and high school teachers come in at forty-ninth. When adjusted for inflation, teachers have received a 10 percent pay cut since 2010. Even if Arizona teachers win their current demand for a 20 percent raise, this still wouldn’t bring them up to the national average. What this shortage means in my daily experience is that when a teacher quits and the position remains empty, these students get split into other classrooms. So the other day I went from having thirty-two to forty students — I don’t even have enough chairs for the bodies in my room. Years of drastic funding cuts have taken a toll on Arizona’s schools. The state’s annual investment in public education is currently $1.1 billion lower than it was before the onset of the Great Recession, which wiped out the housing boom upon which Arizona’s tax base had relied. Per-pupil funding has plummeted since 2007-08: Arizona currently ranks forty-eighth in the nation. Though Arizona’s funding crisis arose in the wake of the Great Recession, its roots lie much deeper. Mass incarceration is one important factor. Disproportionately locking up Latinos and African Americans, Arizona has one of the highest incarceration rates in the nation. With an annual expenditure of approximately $1 billion — over 10 percent of the state’s total budget — the Department of Corrections was the rare state agency that continued to receive funding increases even after the recession began. Here’s the game that’s played every year. Tax cut, tax cut, tax cut — and then a year later, there’s no money for schools. We’re tired of that game. Legislators need to reinvest dollars, the billion dollars that they stole from our students and schools over the past ten years. Let’s roll back those corporate tax cuts — the people who can afford to pay should pay. These cuts have gone hand in hand with one of the most concerted privatizing offensives in the country. About 17 percent of Arizonan students currently attend a charter school — more than three times the national average. One result has been a significant rise in racial re-segregation: while 44 percent of Arizona students are Latino, they make up only 36 percent of charter-school students. What seems like a utopian dream for the capitalist elite has taken shape in a push for privatized schools known as charter schools. … All too frequently they function as privatized businesses removed from community control and instead placed in the hands of CEOs and businessmen and women with profits in mind. Despite the rapid decline of public education, mass protest has been muted until very recently. A “right-to-work” state since 1946, Arizona has a weak trade union movement and no strong labor traditions. Unlike both West Virginia and Oklahoma, Arizona has never experienced a statewide teacher strike. The Arizona Education Association (AEA) — Arizona’s main educators’ union — represents only 20,000 of the state’s roughly 60,000 teachers and staff. People were scared to rock the boat — and then West Virginia happened. All of a sudden, the catalyst was there. They’re doing it, why can’t we? So in the first days of March I got in touch over Facebook with one of the West Virginia strike leaders, Jay O’Neal — we discussed how they had organized their walkout and how we could do the same in Arizona. Garelli connected online with Karvelis, who had helped generate the idea of Red for Ed through a February 27 Twitter discussion with Joe Thomas. On March 4, the two cofounded the Facebook group Arizona Educators United (AEU) with a small core of other rank-and-file teacher volunteers. Though none of AEU’s nine administrators had met each other in person before this time, they quickly proceeded to establish one of the most dynamic labor organizations in the US. Karvelis is perhaps being overly modest. Anybody interested in how a “militant minority” of workplace radicals can build workplace power and strike momentum should closely study the organizing blitz led by Arizona Educators United over the past two months. Through strategic clarity and tactical creativity, AEU has surpassed the level of rank-and-file organization reached by West Virginia, not to mention Oklahoma, where an absence of school-site mobilizing and organizing proved to be a major political impediment. In the process of mobilizing for these actions, the Red for Ed movement began systematically building a network of “site liaisons” at each school. The idea came from Garelli’s experience in the Chicago Teachers Union: “I was only a member during the 2012 Chicago strike, but I learned a lot about how to create school-site power. I saw that you have to set up a real organization on the ground so that when you hit the ‘go’ button, you hit with power.” To gauge its organizational capacity, and to build parent support, AEU organized educational walk-ins before school on April 4. The following day it issued a joint letter with the union calling on the governor to meet with them to negotiate on their demands — a request Ducey has yet to accept. AEU leaders began openly raising the possibility of a walkout, while simultaneously pushing for more mass actions to build up community support. On Wednesday, April 11, over 110,000 educators, parents, and students participated in walk-ins across Arizona. Groups of students, including the Phoenix March for Our Lives, have since pledged their support to the movement. In the words of Tucson high school student Patrick Robles, “my teachers have stood for me, and now I will stand for them on the picket line.” Both the Arizona Parent Teacher Association and the anti-voucher Save our Schools coalition have also actively supported Red for Ed. Encouraged by the massive walk-ins, AEU leaders on April 15 issued a call for a statewide strike vote. After multiple days of voting through paper ballots at each school site, AEU and union leaders made the results public at a joint press conference on April 19. Of the more than 57,000 teachers and school staff who participated in the vote, 78 percent supported a walkout. Armed with a clear mandate for action, Red for Ed leaders announced that the walkout would begin on Thursday, April 26. I’m a registered Republican and a conservative. I’ve taught high school math for 27 years and the last thing I ever thought I’d do is a walkout, but I will walk out this Thursday. Enough is enough. … I love my job and I love the students I teach. I don’t want to walk out, but I will for my students. The organizational strength and legitimacy of AEU has transformed it into a body resembling a bona-fide trade union more than a loose rank-and-file network. Indeed, a recent Fortune article on the impending strike naively assumed that AEU was simply one of Arizona’s two teacher unions. A critical factor enabling the rise of Red for Ed has been the active support of the Arizona Education Association. Various AEU leaders and site liaisons are also local AEA union activists. More surprisingly, union president Joe Thomas and vice-president Marisol Garcia have backed the movement just as enthusiastically. It doesn’t matter who throws the touchdown, I just want to win the game. We have to stand together — it never crossed our minds to do anything else. So when we saw AEU rise up, we immediately wanted to support it. We’ve listened and discussed with its leaders — there’s a real sense of solidarity. This promising development marks a major contrast with Oklahoma, where rank-and-file networks and the union worked separately and often antagonistically. In West Virginia, though there was significantly more collaboration, particularly on a local level, union officials nevertheless maintained their status as the movement’s official leadership. The union’s help has been invaluable. It’s incredible how AEA leaders have worked with us: they’ve let us retain our position up in front of the movement, which is 100 percent rank-and-file led. This has been an incredibly powerful collaboration — I think it’s a great model for other states, particularly those with “right-to-work” restrictions. Support from Arizona school boards and superintendents is significantly more uneven than it was in West Virginia. Though many are going along with the walkout — including those in Arizona’s three biggest school districts — the state’s elected superintendent of public instruction, Diane Douglas, is openly opposed to the action and has declared her opposition “to seeing [teachers] politicize our schools.” Tempe’s school district has announced that it intends to keep schools open by using school staff and substitutes. Without a militant and sustained movement, it will be difficult to overcome these obstacles and force Republican legislators to meet educators’ demands. As in Oklahoma, anti-democratic legal mechanisms unfortunately give the Right considerable leverage. 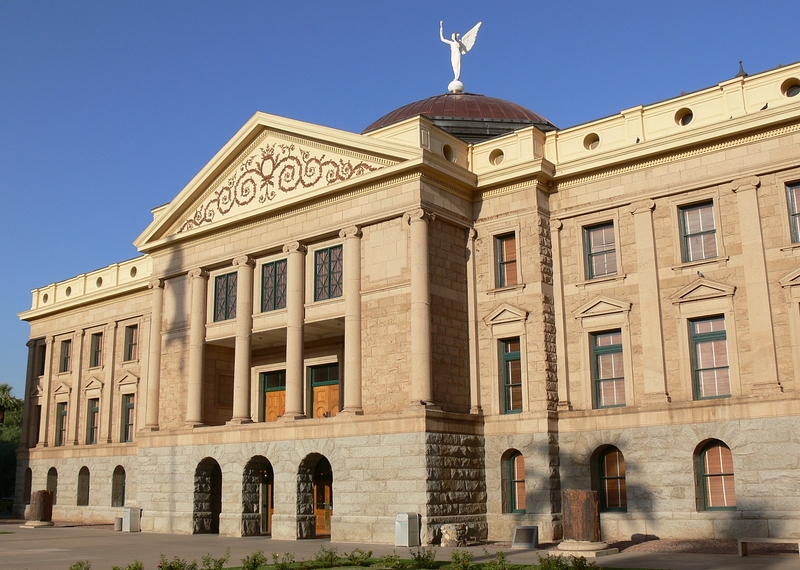 Due to a 1992 ballot initiative, raising new revenue in Arizona requires a two-thirds supermajority in the legislature. Like their Oklahoma counterparts, Arizona’s Republican legislators will likely ignore public opinion and attempt to wait out any strike. The unity of Arizona’s Republican elite, however, has already begun to crack. Governor Ducey, up for reelection in November, is clearly feeling pressure from below. One day after April 11’s massive walk-ins, he announced a proposal for a 20 percent teachers’ pay increase by 2020. The legislature has thus far failed to support the governor’s plan, leading to considerable internecine conflicts. While the Charter Schools Association has enthusiastically backed the proposal, Arizona’s Republican legislators remain more reluctant to make concessions to the educators. Ducey’s proposal, they note, is based on excessively optimistic projections about an economic uptick over the coming years, rather than a reliable funding stream. To address this issue, one Republican legislator announced on April 23 that he plans to introduce a budget amendment to raise the state’s sales tax by 1 percent. [Ducey] made no mention of education support professionals. So that saddens me because everybody knows that it takes a village to raise our students — and that village includes teachers and classified staff. … When I think of his proposal, it’s clearly an attempt to divide us. We’re not going to be divided. We’re in this together. They’re going to rob money from the developmentally disabled? They’re going to take money from the arts? They’re going to sweep money from Medicaid? That’s not what teachers want to see from the future. They want real revenue streams brought into Arizona. We’ve seen decades of wealth being shifted to the corporations. In January, Arizona Schools Now, a coalition we’re part of, put out a list of ways to raise the $1 billion. The politicians ignored us then. Now some are talking about a sales tax, but I don’t think the movement will support it. A sales tax primarily affects the working class and the middle class — it hurts the very families were fighting for. West Virginia and Oklahoma were first. We watched them and we did everything we could to support them. Now we’re up — and we’re in this to win. We’ve got to keep this movement rolling for whoever is on deck.